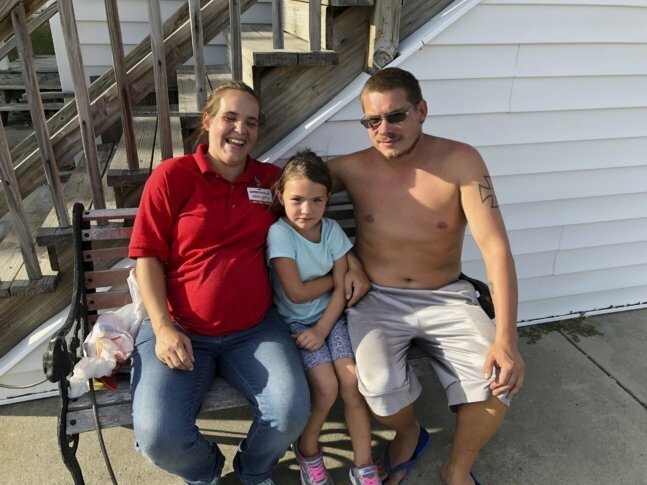 NORTH MYRTLE BEACH, S.C. (AP) — Mercedes O’Neill lives just two blocks from the Atlantic Ocean in a zone so imperiled by Hurricane Florence that it has been marked for mandatory evacuation. O’Neill, who has a son due Sept. 27, thought hard about leaving. But because her family lives paycheck to paycheck, the idea seemed too costly. And she worried about not getting home in time to return to her job at a Family Dollar store after the storm passes. Their dilemma reflects the limited choices faced by many households in the storm’s path. “I could go. But you can’t go for every storm. Yes, I’m scared. But I would be more scared if we were alone. Neighbors helping neighbors, you know?” she said as her daughter, Sophie, rode her bike out of the driveway and into the empty street. Emergency shelters are available, but O’Neill worried that they might not offer enough privacy or take pets. She worried too about her soon-to-arrive baby. Would she be safer somewhere else? Or would she have to accept lesser medical care in another town? Evacuating isn’t cheap. The cost of gas, food, lodging and other essentials adds up quickly. And for many workers, fleeing also means being away from the jobs that provide their income. If the forecast takes a sudden, drastic turn, they still might leave and join the estimated 300,000-plus people who had left South Carolina’s coast by Wednesday afternoon. After the system is gone, O’Neill figures the Family Dollar store will try to reopen as soon as possible, and then she can get back to making money. “It just takes forever to get back in,” said O’Neill’s boyfriend, Kelly Johnson. “I think we all thought about leaving. But since we’re together, I think that will make it easier,” she said. And then there were the cats. Even if she had money and a place to stay, she could hardly bear to leave Klepto (“He always steals the kitty toys”) and Mia (“It’s pronounced mee-ya, but stands for MIA because I could never find him”) behind. “Pets are part of our family too,” she said.